The Pulsar CuTM interconnect utilizes a FINE (28 AWG), SINGLE high-purity BARE copper center conductor, surrounded by a solid FEP dielectric. The double shielded design of the Pulsar Interconenct consists of a foil and SILVER-plated copper braid. The silver plated braid adds the benefit of a low impedance path to ground (helping to minimize ground loops), and preserves the high-end "sparkle" missing in many copper-based analog IC's. The use of the single fine guage BARE copper center conductor eliminates the brightness that may be found in many designs that utilize silver plated copper signal conductors. The raw Pulsar Cu wire is also deep cryogenically treated with a special process developed jointly with American Cryogenics and VH Audio. The standard finished Pulsar Cu interconnects are terminated with Eichmann Gold Bullet plugs and use a specially manufactured ALUMINUM metal housing, to ensure a fully shielded design. This means more durability vs. the standard plastic version of the Bullet plugs. 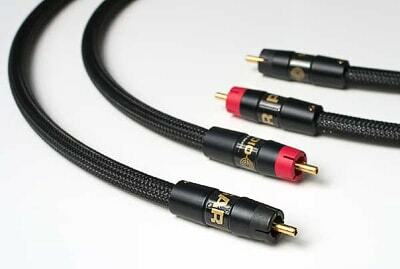 The new WBT NEXTGEN RCA plugs are also available in the copper/gold or silver versions at additional cost. Simply select whatever version of the Pulsar IC you'd like, and add the connector upgrade option if desired. Note the WBT upgrade option is priced per PAIR of IC's. If you only want ONE interconnect with the NEXTGEN plugs, enter a quantity of ".5" for the NEXTGEN upgrade option. purchase within 60 days of purchase, VH Audio will cheerfully refund your purchase price.